The guards at the old prison on Dearborn and Illinois weren’t afraid of much, but one prisoner really freaked them out: Sam “Il Diavolo” Cardinella, the head of a high insular, secretive gang that operated out of his pool room on 22nd Place. 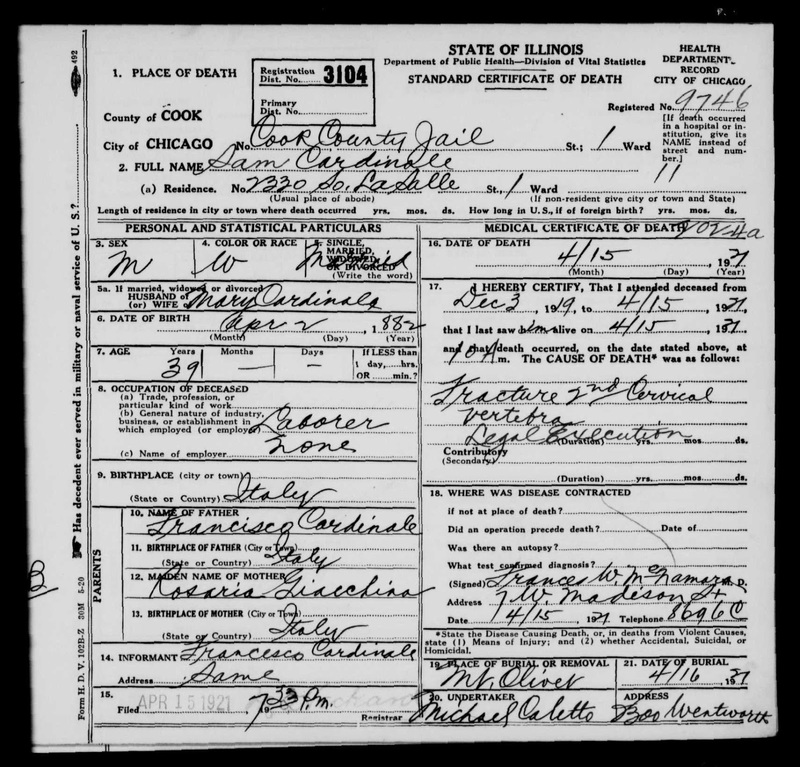 Their whole story was in a previous post: The Strange Tale of the Cardinella Gang. The thing people remember about him the most is that he tried to have his body brought back to life after he was hanged: he’d lost a lot of weight and had a breakdown that forced the guards to tie him to a chair to hang him; a shorter drop with less weight meant a better chance he would strangle instead of having his neck broken. Cops caught his friends trying to bring him back in an ambulance out back. 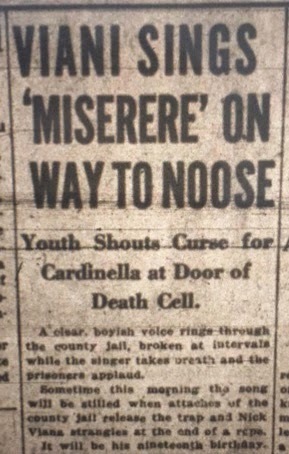 And word among the prisoners was that he thought he’d pull it off because they’d already tested it, successfully, one of his underlings: Nicholas “The Choir Singer” Viana, who had been hanged a few months before on his 19th birthday. In 1936, jail physician Frank McNamara told of stories that had gone around “the grapevine” about “magic” used at a nearby undertaking parlor, which, after an hour, had gotten Viana’s heart beating again, and even gotten him to start moaning, at which point someone gave a signal and the “magicians” backed off, letting him die again (for having been a traitor to the gang). Some newly-uncovered data suggests that maybe, just maybe, it was more than just a rumor. These are the facts: Nicholas Viana was, by all accounts, a good kid until the day that he walked into Cardinella’s pool room on the way to choir practice. A week later he committed his first murder. He was eventually sentenced to be hanged, along with Cardinella and a couple of other members of the gang. I’ve always suspected that his story served as the inspiration for Nicholas Romano, the altar boy-turned-killer in Willard Motley’s Knock On Any Door who coined the phrase “Live fast, die young, have a good looking corpse.” Motley wrote the book while serving as a writer-in-residence at Hull House; Jane Addams attempted to get clemency for Viana. She was unsuccessful, though – they only thing that would have saved him was turning state’s evidence. And Viana was still so afraid of Cardinella that he refused to give over evidence that might have saved his neck, fearing that Sam would “beat this yet” and take revenge on his mother and sisters. At this point, Sheriff Peters had the noose attached – it was a new knot method, using 7 turns of the rope instead of 4. The Evening Post said that it had broken his neck instantly. 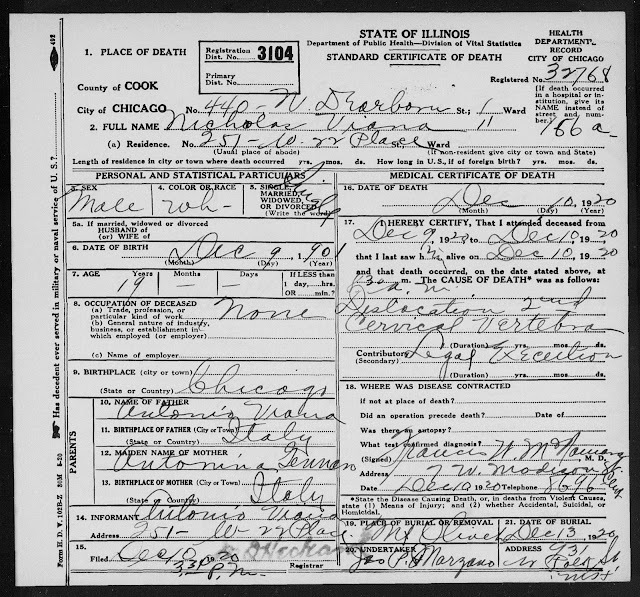 The Herald Examiner, though, said physicians fingered his pulse and found that it had taken him nine minutes to die (the death certificate says the neck was broken) Herald also noted that at the moment he died, a mirror in the courtroom where he had been sentenced fell from the wall and shattered. “Such an effort was made after the hanging of Nick Viana last December,” he told the Post, ” and doctors with a resuscitating apparatus succeeded in getting a flicker of life back into the body, I am told, though they failed in the end.” This came from an unnamed informant, and the sheriff further noted that it was possible that the informant had lied, and Viana was brought fully back to life and was now up and walking around. He further told the Evening Journal that the body had been brought to the undertaker, according to his source, and an attempt had been made to revive him with a pulmotor, and cited assistant jailer Lorenz Meisterheim as the one who brought it to his attention. Meisterheim had heard it from friends and relatives of Viana. Both were satisfied that it was true, with Meisterheim saying that the heart had started to beat when some “unforseen circumstance” brought the procedure to a halt. James Marzano ran the undertaking parlor at 951 W. Polk Street where Viana’s body was taken, and local reporters tracked him down at once. He gave the Journal a flat denial. “I personally had charge of Viana’s body, and embalmed it immediately upon its arrival here,” he said. “There is absolutely nothing to reports that relatives and friends attempted to bring him back to life with the aid of a pulmotor. It is possible some of his friends would have liked to have tried it, but they had no chance.” He went on to say that reviving a strangled man was “barely possible,” but possible. However true the story might have been, it does seem quite likely that Cardinella thought was true. Dr. McNamara remembered that when he met with his family for the last time before his own hanging, he was saying the word “Viana” over and over. This wouldn’t have been the first time that there’d been an attempted resurrection: a more official had been made a generation earlier, when doctors genuinely experimented with bringing murderer James Tracy back to life. 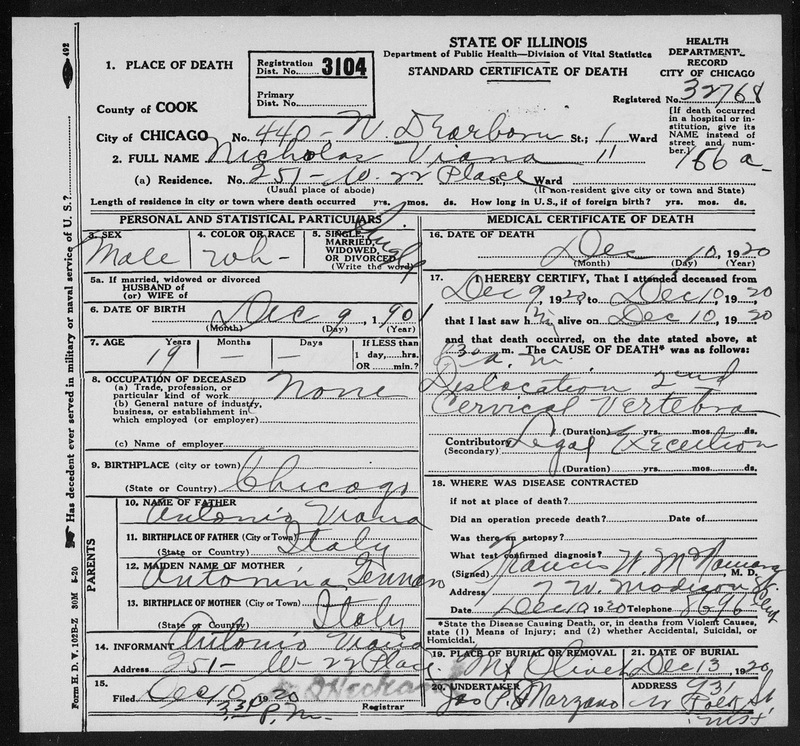 See our post: The Chicago Frankenstein Case. And for more on these cases, see our ebook Fatal Drop: True Tales of the Chicago Gallows. In the 20th Century, executioners in many parts of the world modernized the process by which convicts were hanged. Weights and measurements were taken, and much of the pomp and ritual was taken out of the proceedings. A really good hangman could get a prisoner from inside the cell to dead at the end of the rope in thirty seconds or less. It was when they took his body down after the hanging that things got weird. There had been whisperings that maybe the convicts being hanged were not fully dead when taken down. If they weren’t, that would have led to some odd legal complications. And so, an experiment was tried. Three attending physicians, Drs. Danforth, Bowers, and Haines, took Tracy’s body into a nearby bathroom, rigged it up with electrical wires, and tried to see if they could bring him back to life! “Tracy was pronounced dead by the county physician about twelve or fifteen minutes after the drop fell, but the body was allowed to hang five or eight minutes longer. Immediately after the body was taken down, we commenced our experiments with electricity by applying one pole over the spinal cord and other over the heart, the latter by means of three needles, one over the apex and two over the (illegible) of the heart, the needles being inserted beneath the skin so as to bring the electrical current in direct commnication with the heart. Upon turning on the current the effect was very marked. Muscular contractions began wherever the electricity’s current was reached, but most especially in the face and neck. The heart began to contract feebly but regularly; with the ear over the heart we could distinctly hear or rather feel the heart’s contractions. By mining the electrode we would very easily produce a variety of facial expressions; the arms would contract, the legs moved with considerable force, and the muscles of the abdomen contracted strongly. The most significant fact, however, was the rhythmic action of the heart, notwithstanding the neck was unmistakably broken. It is probable that a considerable proportion of the criminals who are executed in this country are either mechanically strangled – that is, “choked to death” – or killed by shock that is made on the nervous system. In other words, the neck is not broken, and the spinal cord is not lacerated. In such cases we are of the opinion that resuscitation would not be impossible, that electricity frictions, artificial respirations, the hot bath and other well known means of resuscitation might result in resuscitating the criminal. In layman’s terms, they got Tracy’s heart to beat, and they managed to make him look like he was smiling, frowning, and perhaps smelling a fart, but his neck was broken, so full revival was impossible. Still, some convicts choked to death and never did have their necks broken. Could they have been brought back? A few other attempts were made to revive hanged men over the years, though never in the same official capacity – I’ll repost a story or two here this week. Here’s one for Nicholas “The Choir Singer” Viana, who was on his way to choir practice when he first wandered into Sam Cardinella’s pool hall and committed his first murder a week later. He was hanged on his 19th birthday, and, according to legend, was briefly revived after being taken down. Cardinella was a guy who seems to have read Oliver Twist and thought it was a how-to manual. He’d lure kids into his pool hall, then teach them to commit crimes and send them out to rob and kill. Cardinella himself was hanged sometime later. he had lost a ton of weight, and collapsed on the scaffold – they had to hang him tied to a chair. All this was a part of his own grand plan to escape! Low weight and a shorter drop meant it was less likely that he’d break his neck, meaning that, in theory, they COULD bring him back to life. His friends took possession of the body and loaded it into an ambulance, where authorities found a team of doctors trying to resuscitate him. A similar ambulance carrying Viana had been allowed to drive away, though how successful they were in attempts to wake him are strictly the stuff of rumor. The certificate above indicates that they couldn’t have gotten THAT far, but the story was always that they’d simply gotten him to start groaning a bit before stepping back and letting him die. 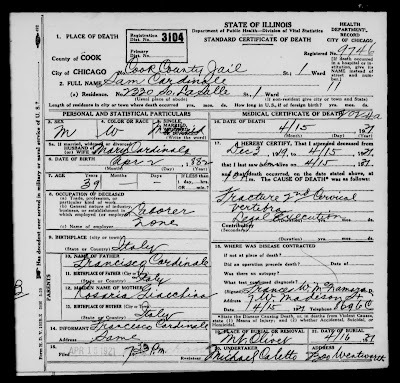 Fun fact: no two records I’ve seen spell Cardinella’s name the same way! Some go with Cardenelli, or Cardanella. This one goes with Cardinale. Carl Wanderer and Sam Cardinella: BFF? It’s always interesting when two crime stories intersect – and in a real way, not another case of the newspapers making wild stabs at a game of “connect the dots” with criminals (like the attempts to connect Johann Hoch to HH Holmes, Louis Thombs, and every other criminal of the day). In 1920, Carl Wanderer was jailed for murdering his wife and trying to blame it all on a drifter (whom he’d also killed). Whether he was trying to get away from his wife to rejoin the army, be with a 16 year old girl, or with an army buddy with whom he was in love depends greatly on who’s telling the story, but one clue is how he behaved in prison. While in jail, he grew bored with the monotony of prison life and the lack of opportunities for exercise. Hence, he asked for (and received) permission to raise an army of convicts and drill them in military formations. His seven men would perform drills at his command, using brooms instead of guns. Two others asked to join, but they were black (this army was not integrated), and, having killed only one man each, seen as unsuitable material for this particular army, which was made up of multi-murderers (the papers listed the average murder per soldier as three). 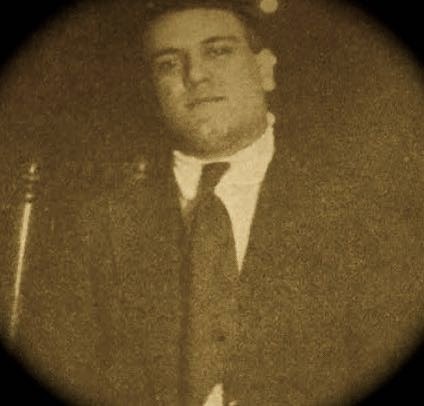 One of the soldiers was Sam “Il Diavolo” Cardinella, the leader of the “murder clique”that had terrorized the city. He may have joined the ranks to help his master plan to escape: he was losing a lot of weight as part of a plot to make sure he would be strangled by the gallows without his neck breaking. 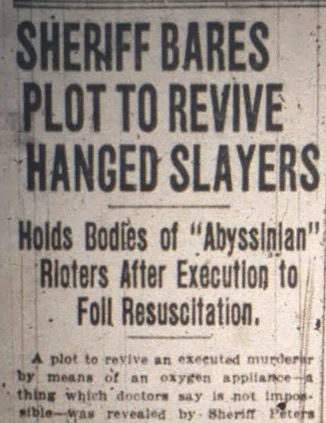 After his execution, the police found his friends trying to resuscitate the body. Also present in the army was Harry “The Lone Wolf” Ward, whose execution was also nearly foiled by a crazy plot to bring him back to life (more on him in future posts). Most of the others were members of the Cardinella gang. 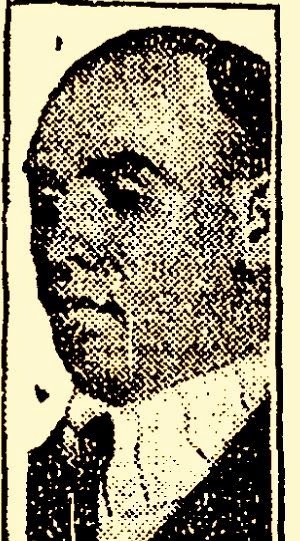 In 1910, a robber named Thomas Jennings was making a run from the scene of a burglary – the Englewood home of Clarence Hiller, who had once been chief clerk of a local railway. During his escape, Jennings fired two shots at Hiller and killed him instantly. But Jennings made a mistake he couldn’t have predicted at the time: he touched some wet paint on a railing with his hand, leaving a print. After his capture, the prosecution used the fingerprint to convict him. Such a thing had never been done before. Upon replying that he could, the attorney said (probably with a smug grin), “All right. Go ahead and do it.” Evans dusted the spot the attorney had touched with powder and showed the jury the print, and a print taken from the attorney matched the one on the paper. But the judge and jury were both convinced, and Jennings was sentenced to hang. A whole lot more about hangings is in William Griffith’s FATAL DROP: TRUE TALES OF THE CHICAGO GALLOWS. Don’t have a kindle? Use the FREE Kindle app for PC, mac, iphone, ipad, android, blackberry, etc! Gov. Quinn is expected to sign a bill that will abolish the death penalty in Illinois last week. Let’s take a brief look at the history of executions in Chicago, some (indeed, many) of which were fairly disastrous. Chicago’s first execution was a public one, held on a portion of the south side that was nothing but dunes at the time. The hangman was “Black George” (who the town crier and the winning bidder at the city’s first slave auction) and the condemned was on John Stone. He insisted that he was innocent, but admitted that he’d killed a few other people. Such was the world in the 1840s. A few more public executions were held on what is now Ashland Street between Polk and Taylor (driving over a pothole on that spot is an odd experience). Public executions were banned in Illinois in 1859, though on some occasions an awful lot of people – as many as 1500 for the “trunk murderers in the 1880s – were crowded into the jail to see the spectacle. Over the years before the state switched the chair in 1927, roughly 100 men were hanged in Chicago alone. Five were hanged in one day in 1912. There were a number of disasters. On two occasions that I know of, the rope broke. The first time, the man fell several feet to the floor and landed on his head. When asked if he could stand, he was in a bit of a daze and didn’t exactly understand the question. “I can stand twice that,” he said. He was brought up to be hanged again. The next time, the man cracked his head open and bled so badly that they were pretty sure the man was dead, but the sentence called for him to be hanged by his neck until dead, so they had to re-attach a noose and slide the limp body down the trap door. There were other times when things got ugly. A couple of men had to be hanged while tied to chairs (though one supposedly arranged to be hang that way to lower the chances of his neck breaking so that he could be brought back to life). He wasn’t the first to undergo an attempted revival – the body of James Tracy was cut down and pumped with electricity right away to see if he could be revived (in order to prove that hangings weren’t effectively killing people). Some men, it could be argued, wouldn’t have been hanged if they’d had better lawyers. Patrick Pendergast, the man who assassinated Mayor Harrison, was clearly insane – the jail physician felt that he was schizophrenic, and it’s fairly obvious in interviews. Had he killed anyone other than the mayor, he would probably have been committed, not executed. Through the annals of Chicago crime, one finds that some men were executed for committing a crime, and others were merely given jail sentences for the same crime. The Haymarket anarchists were executed mainly for being anarchists – certainly all four of them (five, counting Louis Lling, who killed himself before they could hang him) couldn’t have thrown the bomb. Most men who had killed more than once were hanged, but not all. And no female murderer was ever hanged in Chicago (though we sure had a few of those). And the system never has really improved. The death penalty is being outlawed tomorrow not for moral reasons against capital punishment, but for the fact that the studies showed the system to be subject to a great deal of error, bias, and incompetence. That situation will probably never improve. Writing FATAL DROP was a harrowing experience, and, though I was never crazy about it to begin with, I found it impossible to support the death penalty after writing it. If you want to go to an appropriate location tomorrow to mark the occasion, the gallows were generally set up where the garages of the fire station at Illinois and Dearborn is now. There was a jail there at the time. And if you’re going to protest, it won’t be the first time such things have happened there. Before the jail was built, it was a market square. Senator Douglas made a speech there promoting the Kansas Nebraska act (which would have allowed slavery to spread) and got pelted with vegetables. spring chicken, raw oysters, fried eggs, fried potatoes, biscuits, coffee, and apple pie. steak, eggs, toast, fried oysters. half a spring chicken, a dozen raw oysters, bread, butter, coffee, and a dollar’s worth of cigars. Frogs’ legs, ham and eggs, mushroom, french fried potatoes, celery, coffee, a cigar. fried fish, oatmeal, custard, strawberry shortcake, ice cream, coffee. Not all of the hangings in Chicago went smoothly – in fact, there were quite a few really botched jobs. There were a few occasions in the mid 1880s, in particular, when the sheriff did a crumby job of keeping the affair private, as required by law, and the hanging ended up being witness by around 1500 people who had crammed into the prison on what is now Illinois and Dearborn, where hangings were held after 1874. And there were two occasions on which the rope didn’t quite hold. The first private hanging in Chicago, following a state law banning public ones, took place at the old jail at Clark and Washington. There, a murderer named Michael McNamee was dropped to his fate – and dropped. After a several foot drop, McNamee, who was bound, draped in a robe, and covered in a hood, fell tumbling to the floor. The mortified, embarrassed guards asked if he could stand by himself. McNamee, who didn’t seem to quite understand the question, said “I can stand that, and twice that!” He was led up and hanged again – this time successfully. Several years later, a fellow named George Painter’s hanging was plagued by the same problem. Painter, though, hit his head, and the white hood became stained with blood. Guards couldn’t determine whether he was conscious, and the doctors thought he was dead. Still, to be on the safe side, they had to drag the bloody body back to the scaffold, add a new noose, and slide him down the trap door to be hanged again. More details of these men and their (alleged, in Painter’s case) crimes are in FATAL DROP, of course!